So lawns are a big part of the environments around us, and we have had great success at growing them. What does that mean for the ecosystems they inhabit? Well, lawns tend to have specific grass varieties growing in them- according to Falk (1976), the most common grasses found in US lawns are blue grasses and fescues, although you see some regional variation, for example in Florida where St. Augustinegrass is common (Erickson et al. 2008). Some research in the UK suggests that the number of plant species found in any lawn is related to the size of the lawn- as the lawn gets bigger, so does the number of plant species (Thompson et al. 2004). New species arrive as seeds or runners from adjoining vegetation, and Thompson et al. (2004) found that a typical lawn surveyed in Sheffield, UK contained 12-42 different species of vascular plants. Our lawns aren’t exactly a monoculture, but grasses certainly dominate. And one study comparing lawns in New Zealand and Fiji found that temperate lawns had more species, the opposite of what we see when we compare temperate and tropical forests (Watkins & Wilson 1992). Obviously one of the defining characteristics of our lawns is that we mow them. Falk (1980) suggested that the average lawn is mowed 30+ times per year. As we trim the growing grass and prevent it from supporting seed pods, we reverse the situation seen in grasslands where total live biomass is exceeded by the standing dead biomass (Golley 1960). 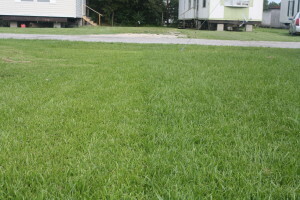 Falk (1976) also suggested that regular mowing means there are essentially two types of invertebrates in our lawns: 1) those that live at the tips of grass and can move quickly to get out of danger, and 2) those that live in the upper layer of soil where they are hidden from mowing and protected from being trod upon by the mulch around them. How do other animals fare? Falk (1976) suggested that lawns offered a bounty of resources for birds that were used to feeding in large groups. According to a study by Blair (1996), however, there is a bit more to benefitting from lawns than just feeding in a flock. While overall bird species diversity was higher in residential areas than in undeveloped areas, non-native birds appeared to benefit at the expense of native birds. He interpreted this to mean that any level of land development was harmful to support of the native bird community. Root & Daniel (1994) felt that mowed lawns in place of grasslands limited the food available for grass-seed eaters, while planting ornamental trees and shrubs in yards increased the food available for birds that eat berries and shrub-seeds. When looking at butterfly communities, the importance of native plant species became very apparent (Blair & Launer 1997). Since butterfly larvae (caterpillars) may depend on specific plants for food, adult butterflies may disappear if those plants aren’t available. This is an interesting situation, since many people (including some related to me) garden with adult butterflies in mind [for example, sowing Monarda spp. (bee balm)]- but, if they don’t provide the food needed by larvae, all those other resources may not help sustain the populations. So it seems like our lawns fall somewhere in between the natural environment and highly-developed urban environments, although exactly where they fall on that continuum probably has a lot to do with how we manage them on an individual basis. Some of the more recent literature on this topic looks at different management strategies and how we can alter lawn routines to make our spaces more suitable for native wildlife. For my next post, I’ll look at how the science of lawn care is being refined so that we can make more informed choices in creating the lawns we want. Blair, RB. 1996. Land use and avian species diversity along an urban gradient. Ecological Applications 6: 506-519. Blair, RB and AE Launer. 1997. Butterfly diversity and human land use: species assemblages along an urban gradient. Biological Conservation 80: 113-125. Erickson, Je, Cisar, JL, Snyder, GH, Park, DM and KE Williams. 2008. Does a mixed-species landscape reduce inorganic-nitrogen leaching compared to a conventional St. Augustinegrass lawn? Crop Science 48: 1586-1594. Falk, JH. 1976. Energetics of a suburban lawn ecosystem. Ecology 57: 141-150. -1980. Taking advantage of local resources: lawns: a case in point. The American Biology Teacher 42: 351-352+355. Golley, FR. 1960. Energy dynamics of a food chain of an old field community. Ecological Monographs 30: 187-206. Hawkes, GR ed. 1969. Turfgrass fertilization. California Fertilizer Association, Soil Improvement Committee, Sacramento. Milesi, C, Running, SW, Elvidge, CD, Dietz, JB, Tuttle, BT and RR Nemani. 2005. Mapping and modeling the biogeochemical cycling of turf grasses in the United States. Environmental Management 36: 426-438. Nutter, GC and JR Watson. 1969. The turf-grass industry, p. 9-26. In AA Hanson and FV Juska [eds.] Turfgrass Science. Agronomy 14: American Agronomy Society. Root, T and L McDaniel. 1994. State-by-state winter population trends of select songbirds from 1960 to 1989, p. 21-23. In ET LaRoe, GS Farris, C Puckett, and PD Doran [eds], Our living resources 1994: a report to the nation on the distribution, abundance, and health of United States plants, animals, and ecosystems. National Biological Survey, United States Department of Interior, Washington, D.C., USA. Thompson, K, Hodgson, JG, Smith, RM, Warren, PH, and KJ Gaston. 2004. Urban domestic gardens (III): composition and diversity of lawn floras. Journal of Vegetation Science 15: 373-378. Watkins, AJ and JB Wilson. 1992. Fine-scale community structure of lawns. Journal of Ecology 80:15-24. « A nation of farmers?